Meet El Jefe. He came to FCER on 4-13-17 via the New Mexico Livestock Board. El Jefe was one horse in a herd of wild horses. His confirmation and his presence leave anyone looking at him with a sense of awe. Then the questions - where did he come from, what kind of horse is he? El Jefe bears striking resemblance to the Colonial Spanish Mustangs. What is that, you may ask. The answer is complicated, and hundreds of years in the making. Turns out the state of New Mexico actually recognizes these horses and has laws in place to protect them. You will find the statute by clicking on this link. The basic idea is that some wild horses contain direct DNA going back to the original horses brought to the "New World" by the Conquistadors. The horses expanded into whatever territory the Spanish occupied. The horses thrived in this new land. Over many years, other breeds were brought in and commingled with the Spanish horses. The very word Mustang means stray in Spanish. 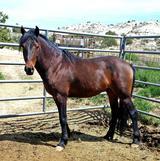 Many people that are engaged in preserving the Spanish horses don't consider them mustangs at all. All that being said, it is safe to say that the modern day wild horses in the Southwest derived in some part from these Colonial Spanish Horses - whether they wear a Federal Government freeze brand or not. I hope I have piqued your interest in this part of America's Horse History. Following are links to articles online that will shed more information on this issue.